Many people in the travel industry try to sell you a fairy tale. Sometimes you sell it to yourself. Before travelling to Côte d’Ivoire, I had picked up on the tale of the fanicos, the great launderers of Abidjan. A hundred of more of them, working in harmony, chattering melodically in a fresh stream in the Forêt du Banco, north west of the city. No wonder too, that laundry would be part of the Abidjan story. They are a smart, brightly and well-dressed bunch, with creases in all the right places. I read wistful travel articles online, published by far flung newspapers from India to Japan. Variously, this band of merry washer folk would be described walking the streets of Abidjan, calling out “Fanico, Fanico!” (literally meaning ‘cloth’). Out would scurry middle class home-makers, handing over a large bundle of clothes for laundering. I was sold, ready and waiting to see the chipper, chatty, no-stain-too-much-for-us washer wizards at work. Rather than buried deep within the dense Forêt du Banco, they were on the edge, by the junction of a main arterial road. Not as idyllic as I had hoped, as car horns blared and exhaust fumes clouded the air. Fine, I thought, some judicious photography would keep the fairytale alive. Their place of work was a 50 metre stretch of waist high river, slow moving and brown with fluvial sediment. Again not ideal, neither for laundry nor for picture postcards. Each fanico had their own work station: a car or truck tire, half floating in the water, and held in place by a chain to piece of concrete on the river bed. Within this circumference, they lathered and rinsed their customers’ wares. When done, the wet clothes would be left to dry on a nearby verge, not too many metres away from the congested roads. As I hopped out of my car, promising the driver “cinq minutes seulement” with camera in hand, I was soon surrounded by six or more local chaps, remonstrating with me in varying forms of animated behaviour. Through their Côte d’Ivoire accented French, my rather rusty A-level knowledge of the language and the fervency of the situation, it took a while for the penny to drop. The Forêt du Banco is a protected area and no one can take pictures there without the proper permissions. Should you be found doing so, your camera would be confiscated and you would be in a heap of trouble in what one senses is a rather bureaucratic country. What of the fanicos then? The dozen or so there toiled, without a smile, without a word. This was a place of work and of grind, knee deep or higher in river water every day, hand washing clothes with caustic soap, and transporting the load to and fro by foot. 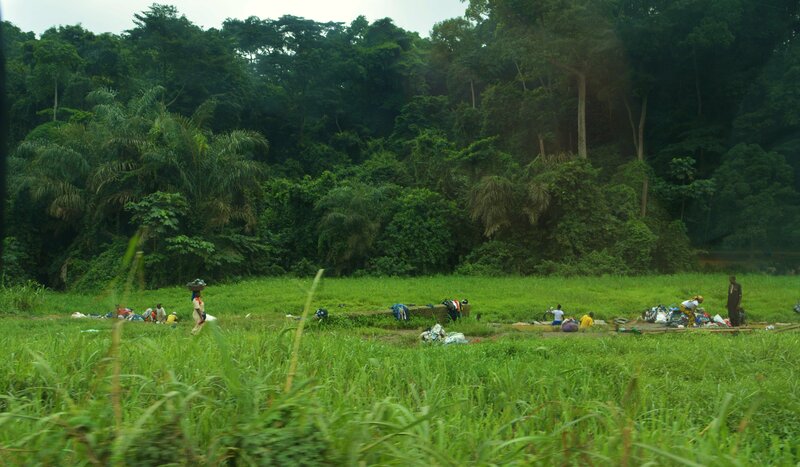 As we heeded the warnings and reversed away from the river bank, with as much plastic detritus poking up through the muddy ground as there was grass, one thing was clear: whilst the fairy tale was over for me, it had certainly never even begun for the fanicos of Abidjan’s Forêt du Banco. Previous Post This is Ivory Coast – TIC!